Blast from the past 2012 post from my first garden in Madison, WI! 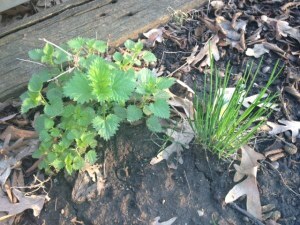 This post is dedicated to Sophia, who had lots of questions about nettles when I mentioned having transported mine to our new garden and looking forward to making a nettle-basil pesto. Because YUM! For anyone interested in growing nettles, I definitely suggest a pot, since they are very difficult to eradicate once planted in the ground. (Sorry, Madison!) They regularly grow on the edge of woodlands near streams, as well as in some gardens. You can harvest with gloves. Crushing the leaves releases the antidote to the sting, and heat also neutralizes the burn. If you carefully toss those yummy leaves (and even stems) into a high speed blender, you can drink nettle smoothies or make a yummy pesto, with or without basil. Herbalists have a saying, “When in doubt, use nettles,” since they reportedly cure so many things. Long infusions made from the dried herbs are particularly fortifying. I also find nettles a fabulous addition to vegan curries, since they take on a slightly fishy flavor and scent when cooked. One of our very favorite nettle recipes is a (cooked) asparagus-nettle-lasagna using zucchini as the noodles layered with tomato sauce and the greens, baked, and then topped afterwards with just a dusting of raw goat cheese or raw Parmesan. It’s so mineral rich that it feels like every part of you got a jolt of deep, wild nutrients. After last week’s unusual animal sightings and interactions, the bizarre fun continues. The praying mantis who “reported for duty” last week is the friendliest insect I’ve come across. He (and it does seem to be a he, judging by size) landed on David’s arm on Sunday, and yesterday, I felt someone looking at me, only to discover it was my little mantis friend, hanging out on the cosmos! He said hi and then continued on his way. Today, he landed on my arm while I was planting strawberries and thyme. We both startled each other when I jumped, but after I apologized for flailing my arm, he turned his head and nodded at me. Just a heads up now that I’m getting more settled into our new home, yard, and the new rhythms of life here. For May, June and July, I’ve been experimenting with a $77 20-minute email special, and I mentioned this special might become a regular offering. It still might at some point in the future, however not at this time. I might just occasionally offer the email options as a special when I feel called to do so. My friend Heather alerted me to this essay contest to win a farm. For anyone who has had the dream of running an organic farm incorporating permaculture principles, here’s a chance for a committed couple (of any type — spouse, mother-child, siblings, you just need two people) to win the land and farm house. If you feel so led, the deadline has been extended until August 1. Aspiring farmers have until August 1 to vie for this small enterprise in North Carolina. June 1 was the original deadline. As that date neared, however, Burns received a flood of questions and comments on the farm’s Facebook page from people who had only recently learned about “The Gift,” as she calls it. And because she has not yet received the number of submissions/entry fees needed to pay off her mortgage so she can gift it to another aspiring farmer, she decided to extend the deadline — in accordance with the rules set up on the website www.essaybluebirdhillfarm.com.